The traditional flag cake gets an oh-so-easy update with this creative arrangement of individual shortcakes and a variety of summery toppings. Our simple Stars and Sweets Shortcake recipe is the perfect choice for hosts who would rather wield a sparkler than a kitchen utensil. 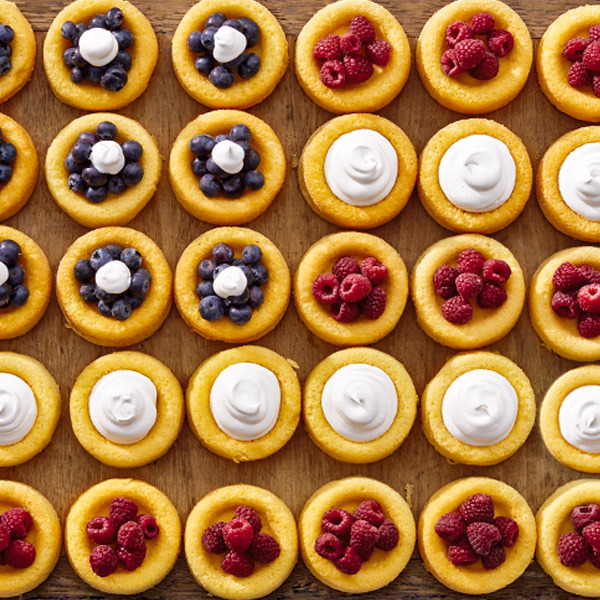 You can even recruit the kids to help create this red-white-and-blue 4th of July dessert. Lay out the shortcakes in a rectangle with 6 across and 5 down. Starting from the top, left to right, fill 3 cups with blueberries and then 3 with raspberries. For the next row, fill 3 with blueberries and 3 with whipped topping. Then for the third row, fill 3 with blueberries and 3 with raspberries. For the fourth row, fill 6 with whipped topping. For the fifth row, fill 6 with raspberries. Top the blueberry shortcakes with an additional dollop of whipped topping. Serve additional berries and whipped topping on the side.